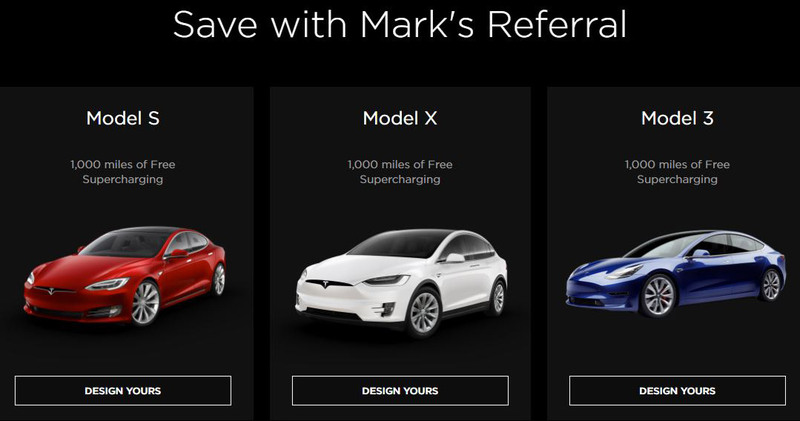 TeslaMark.com – Use Mark's Tesla Referral Code To Get Free Supercharging! Hello! If you are reading this, you have probably already test driven my Tesla Model 3, but if not, feel free to reach out if you’d like to take it for a spin! Tesla offers new owners 1000 miles of Free Supercharging when someone uses an existing owner’s referral code when placing their order for any new or inventory Tesla Model 3, Model S, or Model X. To use my referral code, CLICK HERE to order online or give your Tesla Sales Rep referral code mark26115 if you are ordering in person. Start designing your Tesla now! If you have any questions not covered in the FAQ, like which Tesla is right for you – Model S, Model X, or Model 3 – or even questions about adding solar panels to your home, maybe I can help. I’m a former Model S (P85+) and current Model 3 owner and I’ve had solar panels on my roof for a few years. I’m also happy to let you test drive my Tesla Model 3 if you are in the area (Melbourne, Florida) and want to check it out in person. Feel free to send me a message through the form below.